OpenStack is a free and open source cloud computing platform developed as a joint project of Rackspace Hosting and NASA. Users primarily deploy it as an Infrastructure as a Service (IaaS) solution. 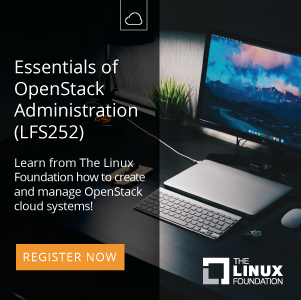 OpenStack cloud consists of many well know technologies like: Linux KVM, LVM, iSCSI, MariaDB (MySQL), RabbitMQ or Python Django. Ceilometer: metering engine for collecting billable data and analysis. In this tutorial we will install OpenStack Juno release from RDO repository on two nodes (controller node & compute node) based on CentOS 7 / RHEL 7. Here attached: answers.txt file used during our installation. * File /root/keystonerc_admin has been created on OpenStack client host 192.168.2.4. To use the command line tools you need to source the file. 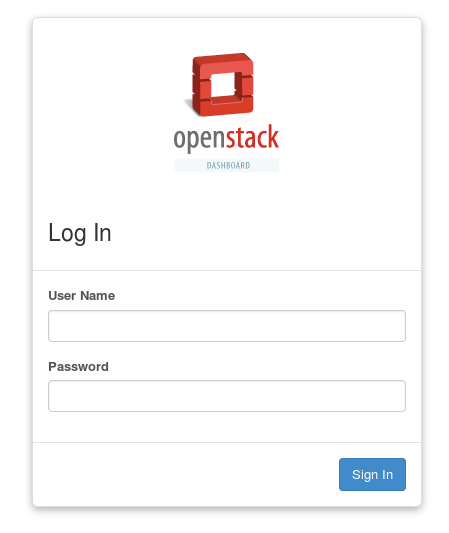 * To access the OpenStack Dashboard browse to http://192.168.2.4/dashboard . Connect eth0 interface to br-ex bridge on controller node. Below command will trigger network restart, so you will lose network connection for a while! The connection should be brought up again, if you modified ifcfg-eth0 and ifcfg-br-ex files correctly. Time to check our new OpenStack cloud status and functionality. 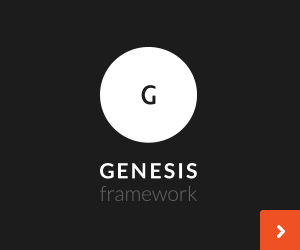 Find out, how to Create project tenant in OpenStack and launch instances. Let’s say I don’t have two network interfaces on my Compute Node. Could I assign an address to br-eth1 on the Controller and another IP on the same network to br-eth1 on the Compute? This way, the services on the Compute Node would be listening on this address, but the bridge would still exist. Do you think this world work? Hi Joao, I never tried such configuration, I have always used separate network interfaces for external and internal traffic. …from my side I can assure this is the fastest way of testing OpenStack. You have explained it very well. Can you explain us configure two controller nodes and with one keystone service and multiple compute hosts. Hi Khan, I will try to prepare such tutorial, but it will take a while, since I am busy right now. Thank you for your suggestions, they are important for me. …this is how packstack distributes services between nodes according to answer file. Thank you got a clear picture now. em2 is the physical interface between the two nodes. is “physnet1” useable in my case ? or it doesn’t matter ? Is it something I missed ? I wonder what version of OpenStack do you install? …if this is Liberty, then try another version. Your configuration looks O.K. for me. Thx for prompt answer . Yes I’m using Liberty release. AFAYK , could it be related to this bug ? On the controller/compute node , no problem to start an instance. Yes, this is related to that BUG, that’s why I recommend you either install once again with another OpenStack version or create bridge manually using OVS commands. First option should be faster for you. In order to fix this issue , what’s your hint : Kilo or Mitaka ? If you choose Mitaka, please let me know, if it worked for you with Compute node. For you it is the same problem as the one described in the RedHat bugzilla ? Then restart packstack to reinstall only the compute node …. I’m able to start an instance on the “faulty” compute node. in order to set public and private networks and launch instance by using floating IP stuff ? An additional question : traffic in/out towards the instance hosted on the compute node will use the “no IP” private link eth1 ? Internal traffic uses eth1 interface. Did you try connect eth1 for more than 3nodes together? How did you do that if you did? 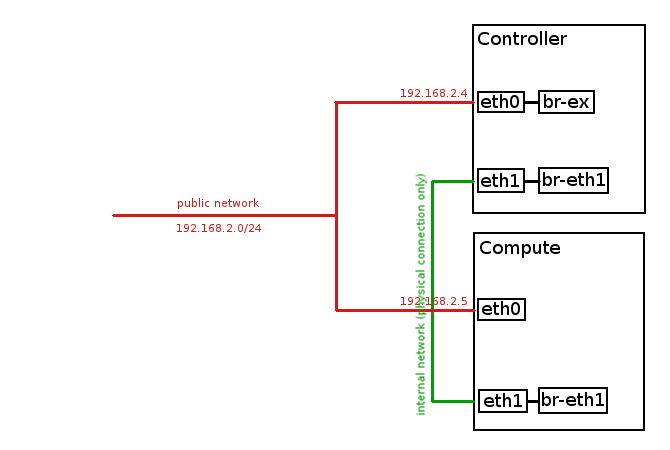 I connected eth1 directly according to your diagram for 2nodes (controller and compute); everything was okay; and I can ping every IP. But when I added one more compute (controller+2compute), then I can’t connect eth1 ports directly, so I used anther switch (one exist switch was used for connecting all eth0 ports together) for connecting these 3 eth1 ports together. Finally I found I can’t ping instances IP (floating IP) but I can ping virtual router IP. But, if I recovered the connection of eth1 ports directly each other for 2nodes, I can ping everything: instance IP, router IP, either private IP. Can you suggest how to connect eth1 ports for over 3 nodes according to your professional experience? By the way for internal traffic connection you don’t need IP assigned to eth1 interfaces. Check if eth1 interface is UP on the new compute node after adding it – this was common error I used to encounter many times. This procedure doesn’t create bridge on the compute node. br-ens33 in my case is created only on network node and not one compute node as mentioned in this blog. Only br-ex is created by default on compute. Could you please clarify? By the way I am using Newton release and its not creating the additional bridge.